SNOEL'S BLOG: Er well... More Snow!!!!! 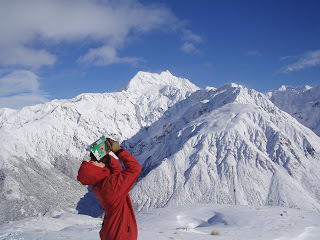 Today I awoke to bluebird Sky's and no wind (as a gale was forecast) so I quickly packed a lunch and headed to Temple. It was their opening day today and the trail was already well blazed before I skinned up it. The snow was still powder and despite temperatures of minus two. Phew! Temple was pumping - Great to see the tows going and folks shredding!!! I'm stoked for the staff, who work extra hard up there to make it all happen, along with all the volunteer effort that goes in! For my part I checked in with patrol and then headed for more laps in Casidy's - I think about four in total in knee deep powder. 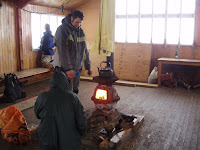 After a break I headed up in variable conditions to Temple tow and then Page Shelter, which I was surprised to find occupied with the fire going! Its normally way colder than my fridge in there! The guys were working on downhill. As for gear today I suffered the usual problems masses of compacted snow creates to boots and bindings -ie totally locked up. I'll reserve judgement, as my f1s did their 'i'm not going to lockdown for downhill thing' or came unstuck at that really critical turn. Very frustrating when you've worked so hard to get those turns! But then again maybe I'm expecting too much from them, after all they have been modified- and would probably have far less flex with their tongues back in them! I think I'll try that, and see how it works. Here are a few photos from the day. The guy drinking paint is Ash.